Sometimes all it takes are a few "add-ons" to complete a look. Take for instance this chambray dress that I literally bought almost two years ago. It's been a handy little dandy over the years. The miraculous thing about it is that it can transform into something new each time I add a few fresh accessories. With the amount of nauseating bills we just got nailed with from the dentist and veterinarian + our late summer vacation starting Friday, this girl has no other option than to incorporate more "add-ons" to pieces hanging in the closet (for the next several weeks) and NOT from a store rack. Willpower, please take over me and my not so logical mind when it comes to clothes. I love your outfit!!! Especially loving the chambray with the hot pink shoes!!! The close up of your face without your sunglasses on is soooo pretty! 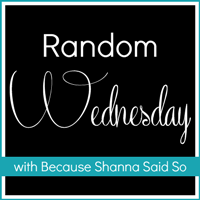 Thanks for letting me join you in your Link Up! Would love you to visit my blog. P.S. I totally get where you are coming from with the whole will power vs. Bills situation!!! i have similar sunnies from old navy!! Love, love, love this entire look!! 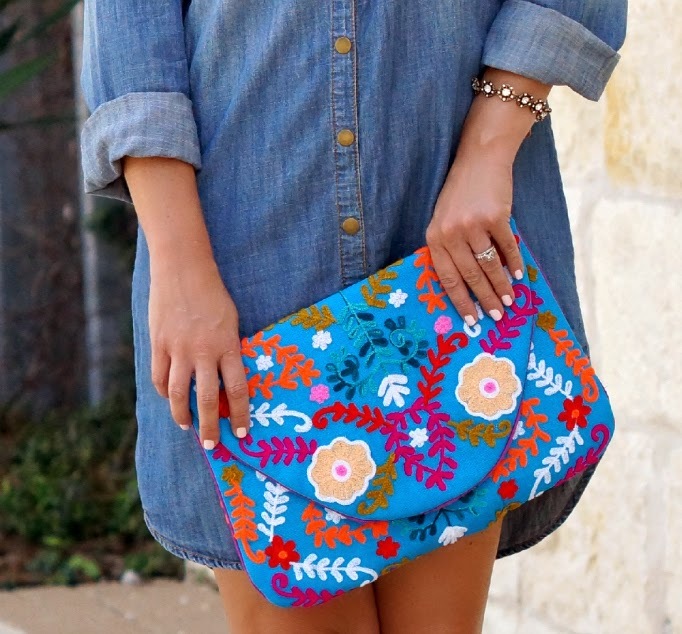 I absolutely need a chambray dress and that clutch is pure perfection!! Love this dress and I love how you accessorized this outfit while keeping the dress just as it is. Good luck no resisting temptations at the mall! You can do it! Love those heels. They are so fabulous. You look like... a Texas Barbie.In a good way. I love Barbie. That is a lovely look Shanna. And you are right, it is a great, versatile dress. I am a big fan of shirt dresses in general. Also your clutch is totes adorable. I love your dress! And those shoes!! This shirt dress is everything I wished it was still available, you look stunning. I love that dress! So cute with those shoes, and I am obsessed with that bag! Great look. This is so true! I wore a black dress that I always add on to and it works on so many levels. Great look, Shanna! And I totally hear you on the shopping from your closet. I'm in the same position right now. Hard with fall coming around the bend! I've been convinced that I need to add a denim dress to my closet, and I'll take this post as encouragement ;) I LOVE the way you paired with with hot pink shoes though - didn't even think of that, but it looks so awesome! I really need a dress like that, I love how versatile it is! Your heels are so cute! This dress seems terribly comfortable! It's really cute too, love how you've styled it here. I love this outfit so much! The dress actually looks comfortable (yay!) and that clutch is so pretty! Plus, I love white nail polish too! August is denim season and your are rocking this chambray dress! Love what you did here! It looks fresh and your accessories are popping. Love that dress, an oldie but a goodie! I love those types of pieces. Shanna~ I am in love with this dress! And you're so right...accessories make all the difference. Obsessed with this! I am a huge sucker for chambray shirts and why not add a dress into the mix! Love all the pops of color. Chambray makes the perfect backdrop for anything. Really love this cute look! 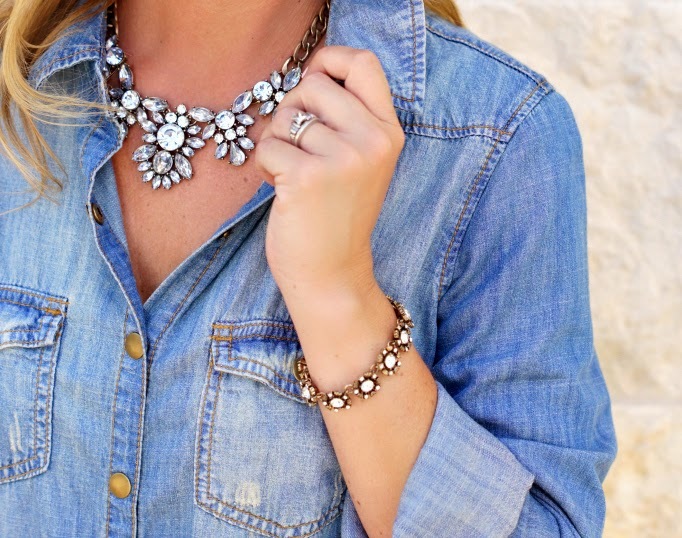 What a great way to glam up a denim dress! ADORABLE! I totally think accessories can make an outfit, I love your necklace and clutch here. 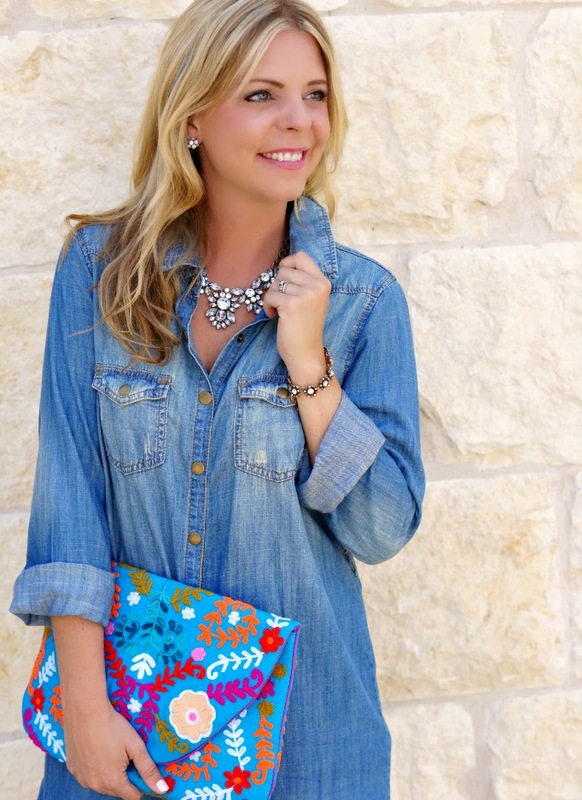 Absolutely love this chambray dress and how cute is this embroidered clutch?! It is amazing what accessories can do to totally change an outfit! I can imagine this dress looking really different dressed more casually. It's always nice to have pieces like that. You look great! Go Shanna!!! The devil is indeed in the details....but that chambray dress looks just as fresh as it was and that's what we get for buying the classics....it never gets old!! I've been seeing this bag everywhere and it's just so pretty and colorful! I love this look! Every time I try out a shirt dress I feel like I look like I left the house without pants. I think the missing piece is heels. I can't wear it with flats. I love how you dressed this look up! You've got the power to not shop! Just look in your closet lol! I totally agree about the "add ons" and it seriously makes this outfit SO fun! That's what I love about chambray dresses, you could wear them forever and in so many ways. You look super cute! Love the clutch and shoes! Chambray is your colour, you look stunning in these pics ( well you always do but there is something in these ones that pop). Love the dress and accessories and a shopping hiatus, ouchie but for all good reasons. Love when older items can get remixed and revived with some accessories! Not to mention, those accessories are amazing! You look great, and I love the add on's. That dress is really nice and can be worn so many ways. Great find! Love those shoes. Well anything pink my book is pretty darn awesome. Your accessories are amazing and completely make this outfit! I love your clutch! Super cute look!! Good luck with savings! I always try to do that with good intentions, but it never lasts more than a couple weeks! Shanna, your pink heels are insanely cute! Love them! Great look. Hahaha "handy little dandy" cracked me up. That necklace is stunning. I'm obsessed with your clutch ... gorgeous!! I love love love this look!! You look fabulous. The chambray dress with those shoes and that necklace. Seriously fantastic! This would make me look like a potato sack, but YOU look AMAZING! So easy but still spunky and fun! I love that accessories can make an outfit feel brand new! And this is a perfect chambray shirt dress! The accessories definitely make the outfit pop! Loving every single piece of this outfit!!! Seriously, LOVE this outfit Shanna!